When I am commissioned to capture a bridal portrait session here in Charleston, Sc, I always try to think out of the box to create different spectacular images for my clients. After all anyone can capture that but what makes me a bridal portrait and one of the best photographers in Charleston, Sc, that sets myself apart from other bridal photographers, here in Charleston,Sc, is that I aim for perfection by giving my clients various amazing images with great results. Knowing my photography equipment, having the right light or just adding a strobe to the image, to give it that pop, or wow factor, can make a huge difference. Sometime when you are hired to photograph a bridal session, you have too many images of the bride and her dress, there are more to it, her hair, the jewelry, the bouquet, the veil, or any other accent that is included in her dress. Many times, I see many photographers concentrating on the bride shoes, as a detail photo during her wedding. Not for me, I have no problem capturing her extravagant shoes, complementing her gorgeous bridal dress during the bridal portrait. 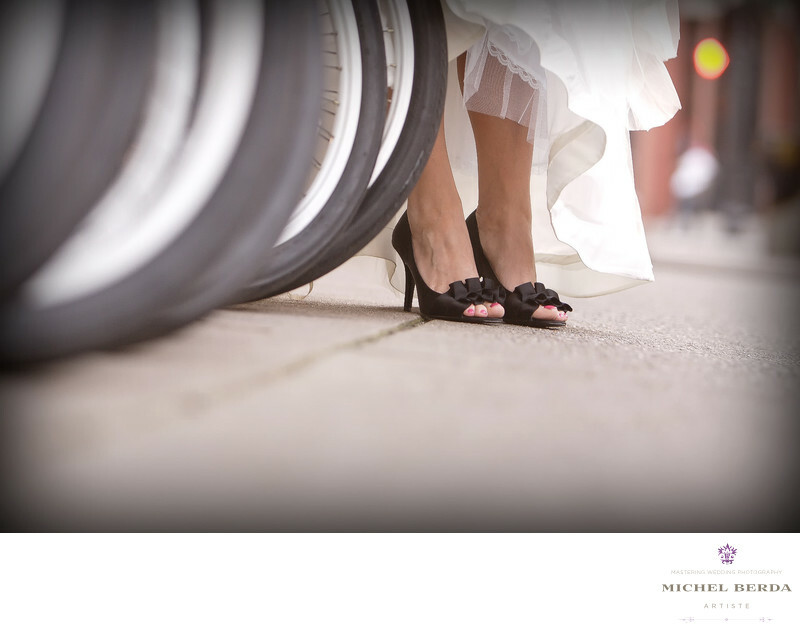 As in this image to make it more appealing and artistic effect, I decided to use the bikes tires has the leading lines, that takes your eyes to her amazing shoes. The final image in post production and what I did to make this image just that much more appealing, a very nice capture. Location: 1225 Blakeway Street Suite 1303. Keywords: Bridal Portrait (84), Bridal Portrait Photographer (84), Charleston (1179), sc (309), Water Front Park (21), Wedding Photographer (1254).